Exciting news! The new release by Altenew is out and it’s amazing! 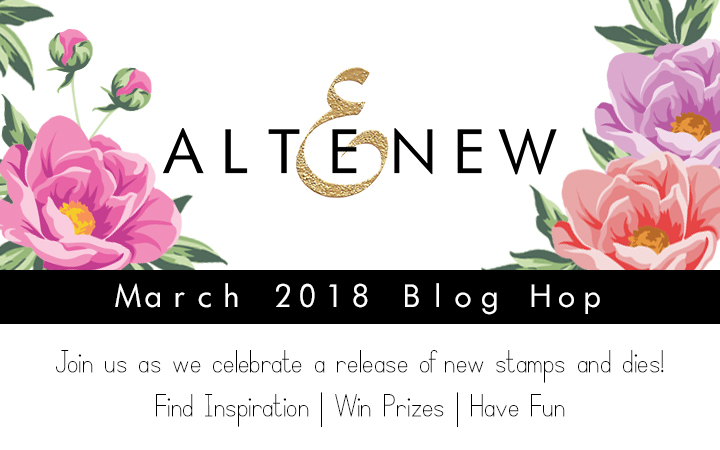 Today we celebrate the new stamp and dies release with a blog hop to inspire you and there are also lots of giveaways along the way. 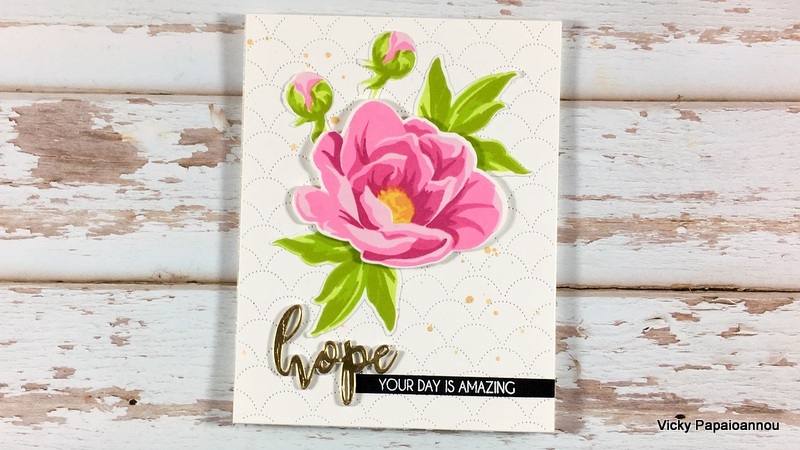 For my card today I used the gorgeous Hope Stamp & Die Bundle ( ALTN | SBC ) . This is a gorgeous flower that you can easily make by layering stamps. 4 layers with different inks and you get this beauty! How easy is this?! When it comes to layering stamping I love the oval sets. 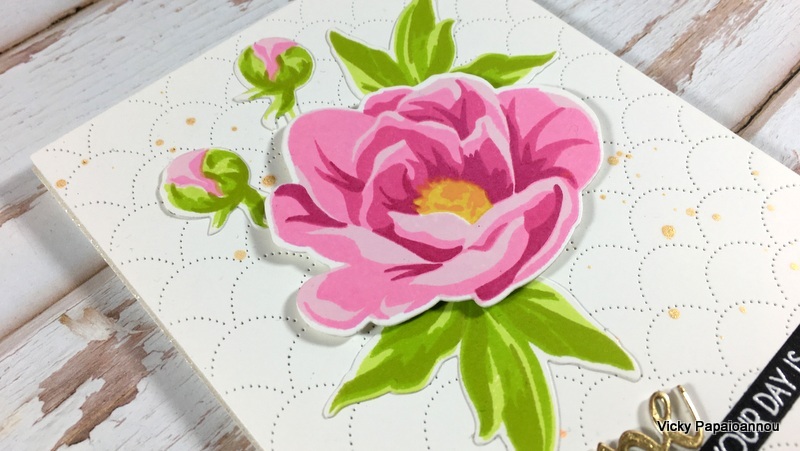 for this flower I used the Altenew CHERRY BLOSSOM OVAL SET Crisp Dye Ink Pads ( SSS | ALTN ) The oval sets are great because they do all the work for you, 4 colors in each set that go perfectly together for the layering look. I also used the matching dies to cut out all my images on the Mini Blossom Die Cutting Machine ( ALTN | SSS ). As small as it looks it’s amazing how many dies it can fit. For that beautiful detail at the background I used the Dotted Scales Debossing Cover Die( ALTN | SBC ). It gives a really elegant look and just enough detail without making the background busy looking. I also used the Altenew – Ink Spray – Metallic – Antique Gold ( SBC | SSS ) to give a touch of shine and elegance. The world “hope” on my sentiment is also gold so those little splashes really bring the whole card together. Leave me a comment below and let me know your favorites from this release! I will draw a random winner to receive a $30 gift certificate. I will announce the winner on my blog on 3/30/2018. There are giveaways on every stop of the hop too! Amazing card. I love the Hope bundle! Your ideas are born out of this world, and your products are made for one of the kind! I would love to accompany you forward on this journey! Thank you for including me to make it happen! Simple and beautiful! Love the flower and the inks. Thanks, Vicky! So pretty! These are my favorite colors from Altenew. Makes beautiful flowers! I am loving the dotted scales debasing die all the more as I see it being used. My wish list is getting long. I love the way you have coloured the hope sentiment in gold as it just pops out. this is a very pretty stamp set and I do plan on getting it very soon, thank you for your creative genius!!! My favorite is the Sweet Rose Bouquet! Absolutely gorgeous! The March release is fantastic, so it’s hard to pick a favourite. I really like the dearest friend set and the dotted scales though. So pretty! I love this card. I love the large floral of the hope set and also the sentiments it contains. A very stunning card. The focal pops off of the subtle background die. Thanks for sharing. Beautiful card, lovely colors. I am getting a big collection going of their stamps, they really are awesome. I really enjoy your blog, I love when you do the journaling and the mixed media, you are totally amazing at that, and your coloring is awesome girl!!! 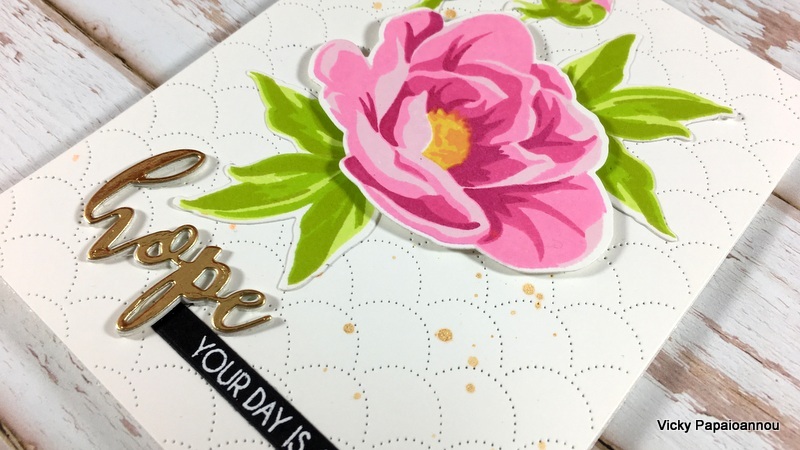 Love the card you made with the Hope Stamp set with the Dotted Cover die. So pretty! The Dotted Cover die is very useful for a background. Many of the designers are using it on their cards. Going to have to put that die in my cart! Thank you for sharing and the opportunity to win. This is very pretty! I love the background die. These layered flower stamps look lovely! I love that Hope set. The flower is gorgeous, and the little buds are so sweet too! I really like how you added the gold splatter and sentiment; it makes the card feel extra special. Thank you so much for sharing your talents with us and being willing to design for so many teams! I always learn good things from you, and I appreciate it. Very pretty! Love the layered stamps! Thanks for sharing Vicky! Have a lovely day! So pretty! Lovely layered flower! Such a pretty card! I love the colours! Gorgeous card! I love that background die, it is very elegant and adds that touch to the card! Thank you for the inspiration! Oooh love your layout. Thanks for sharing this beautiful card! I love the new Hope Stamp Set. Such pretty flowers! Your card is really beautiful! Thanks for sharing. 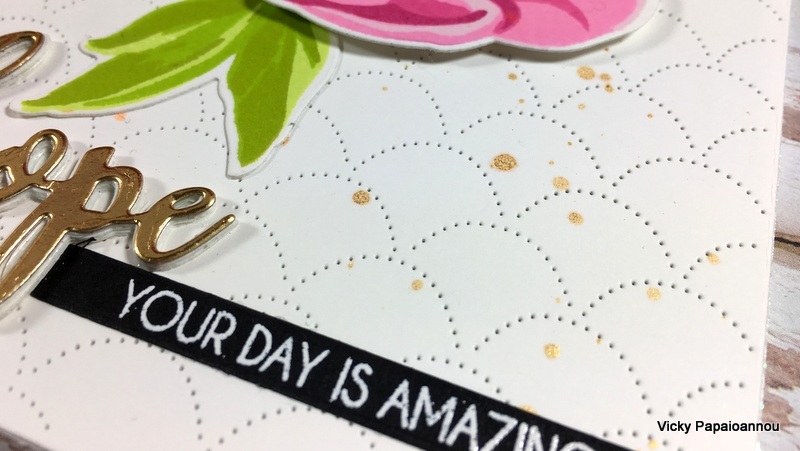 As for my favorites from this release – there are so many but the stitching stamps and dies are probably at the top followed by the sweet roses and the lovely hope set that you used today. Love this release from altenew. This stamp HOPE has already delivered to my house.. Love the colors you used! This is stunning! So beautiful and elegant!